The object of Weinmann’s admiration is a scrapbook. As King of Carnival 1996, he received it as a gift from the Rex organization. According to Rex archivist Dr. Stephen Hales, similar gifts are made to all other monarchs and their Queens. Each becomes a prized possession. “It’s big: about two feet by three feet. And it’s bound in leather,” Weinmann says. Filled with mementos of his reign, all properly captioned, the book occupies a place of honor in his library. By the 1830s, people were already saving clippings and paper mementos on decorated pages in scrapbooks. In New Orleans, an advertisement for “juvenile scrap-books” for sale at the “New Orleans Literary Emporium, Number 14 Camp Street,” appeared Dec. 24, 1843 in the Daily Picayune. Newcomb’s collection of scrapbooks includes early Newcomb College students’ college scrapbooks: “They made their books about growing up, becoming their own people.” Other scrapbooks in the collection cover a debutante year and an overseas tour by Tulanian singers. 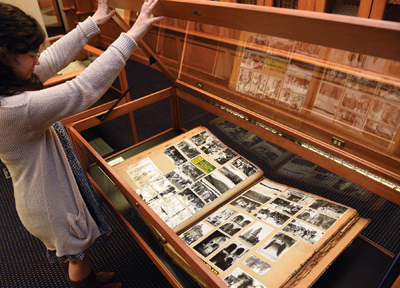 The Loyola University Archives hold scrapbooks of university activities, including students’ summer studies in Mexico as well as commonplace books (an earlier form of scrapbook including mainly written material). One bachelor’s book begun in the 1800s includes household hints. A man kept a scrapbook of a trip to New York; a woman pasted in photos and wrote a narrative of two couples’ cross country trip (including all their expenses). Hand-drawn decorations illuminate the book kept as a girl by Lise Tallant, aunt of author Robert Tallant. Scrapbook keeping went out of fashion around 1960, according to Tucker. But, by the ’80s, businesses selling scrapbook making supplies were proliferating and soon were online. Michel Boudreaux has long been a consultant for Creative Memories, a direct sales scrapbook supply company. Supplies include “our albums – they’re sturdy and well put together, plus pages, page protectors, adhesives, pens and fun embellishments.” You can find her online at CreativeMemories.com/user/michelboudreaux. She also creates online scrapbooks through a company called Forever.com. “Scrapbookers say ‘crop till you drop,’” laughs Boudreaux. Groups of scrapbookers gather and work on their own materials. (Boudreaux regularly goes with a group of six women for a two-week “crop” in Orange Beach, Alabama.) “Crops” are held twice a year in Rayne, Louisiana, for several hundred participants. Scrapbooker Lisa Arseneaux is currently making a “baby girl scrapbook” for a new mother. Arseneaux has posted things on Pinterest and does Google searches for supplies and layout suggestions. She also shops locally: “Wal-Mart has a little section and so does Tuesday Morning.” Craft store Michaels’ Clearview location (there’s also a location on Claiborne Avenue) stocks supplies, offers occasional courses and has a room for scrapbookers stocked with a selection of tools. Scrapbooks are also meant to be appreciated in the future. “The old ones got yellowed and faded,” Arseneaux admits. “Nowadays, with the clear sleeves and the acid free paper, I’ve been told they could last forever,” she says hopefully.